Lots of photos you see on Facebook are added when people are nowhere near a computer. Instead, they’re sent from an iPhone and are the photos of things that happen while you’re out and about. Things that are beautiful (spring blossoms! ), or weird (how did this person lose only one high heel? ), or just emblematic of your day (another cute photo of the baby). If you add the Facebook app to your phone, iPhones and Android phones try to make it as easy as possible to send photos from your phone right to Facebook. From your photo gallery, tap the photo you want to share; then tap the Send icon at the bottom left of the photo. A menu of options appears, including things like e-mail or text messages. If you previously installed the Facebook app, you should see the Facebook icon among the other options. A Facebook window for sharing that photo appears. (Optional) Use the keyboard to type any explanation the photo needs. 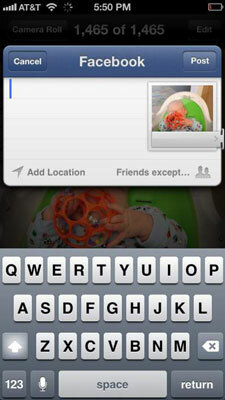 (Optional) Tap Add Location to use GPS to share where you’re adding the photo from. (Optional) Tap the Privacy menu to change who can see this post. Remember, by default, the audience you shared your last post with will be the people who can see this post. Tap Post in the upper-right corner of the Facebook window. The photo is added to your Timeline as part of the Mobile Uploads album, and it may appear in your friends’ News Feeds. If you use an iPhone, you can download the Facebook Camera app specifically for taking and sharing photos. This app gives you tools like filters for your photos and makes it easy to look only at friends’ photos.